Transportation Costs > How Much Does the Hoveround Cost? How Much Does the Hoveround Cost? 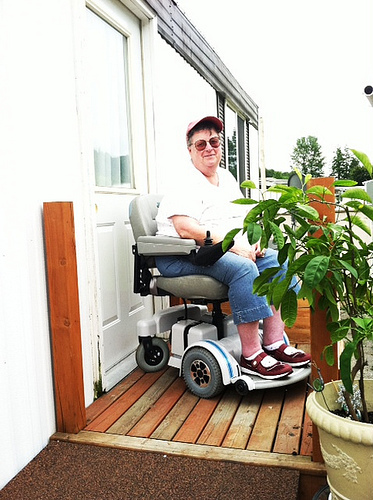 For more than 25 years, the Hoveround Corporation has been the largest direct-to-consumer manufacturer of the most maneuverable, reliable, and compact power chairs available in the United States, according to the official website. To date, the company, based in Sarasota, Florida, has over 100 facilities and 140 fully stocked repair vans throughout the country. Controlling the design, delivery and service process, the company holds itself 100 percent responsible for the quality and reliability of the product and is known for many of the advertisements as seen on TV. According to the company’s official website, the prices for their standard and power wheelchairs are listed if you were to pay cash or credit; however, if you wanted to use your private insurance coverage or Medicare, you would have to see if you qualify as the products may be eligible for insurance at a discounted rate if you do qualify. To know if you qualify, they simply ask that you fill out the form on their website, and from there, a representative will contact you with more information. If you do not want to fill out the form and would rather talk with someone immediately, then you can call the company directly at 1-800-542-7236. In conclusion, the costs will depend on the current availability, insurance, the configuration, the exact size/model, the condition and the additional options if you were to add them. NOTE: These prices were sourced from the official website and can only be deemed accurate at the time of this publishing. For more information in regards to the official pricing, we encourage that you visit the official website for more up-to-date pricing. Will insurance, including Medicare, cover the Hoveround? According to the official company, they note that you must be able to provide medical documentation from your patient charts which note your continued use and the medical need for the equipment. If you do decide to use your Medicare benefits, then the company will not be able to provide service until documentation is received from your doctors but have the option to pay out of pocket for the said repairs if you so choose. They also note that you must provide any new documentation about the continued use every 12 months. In conclusion, in order to be approved, you must meet the Medicare guidelines, which includes a physician’s order that contains specific elements, which must be received within 45 days after the order, and a face-to-face mobility examination. 9 out of 10 customers will meet the criteria as long as you have met your deductibles. Accessories: According to the accessories subsection, the company also offers a myriad of accessories, such as a collapsible grabber, Hoveround backpack, drink holder, rear basket and/or an armrest bag, with each item retailing for $35 to $100. Car Carrier: The company’s official website offers a range of car carriers, with each offering a different setup and weight capacity. Each carrier comes with an easy-to-use three position loading ramp that folds into the carrier when not being used. Costs ranged anywhere from $599 to $899+ if purchased from the official website. Cover: To protect the Hoveround from the outdoor elements, the company offers a weather-resistant nylon cover retailing for about $99 if purchased from the official website. Shipping: Standard shipping, as long as you make a purchase larger than $50, will be free; however, if you want to take advantage of the “Hoveround White Glove Delivery” service, then an additional $250 fee will apply and will include someone personally delivering the chair to your home, setting it up and helping you with training. Vehicle Lifts: The company offers a powered lift that retails for $1,900 to $2,500 depending on the setup.